The AFP's public affairs chief said martial law is needed to keep threat groups in Mindanao from recruiting and regrouping. 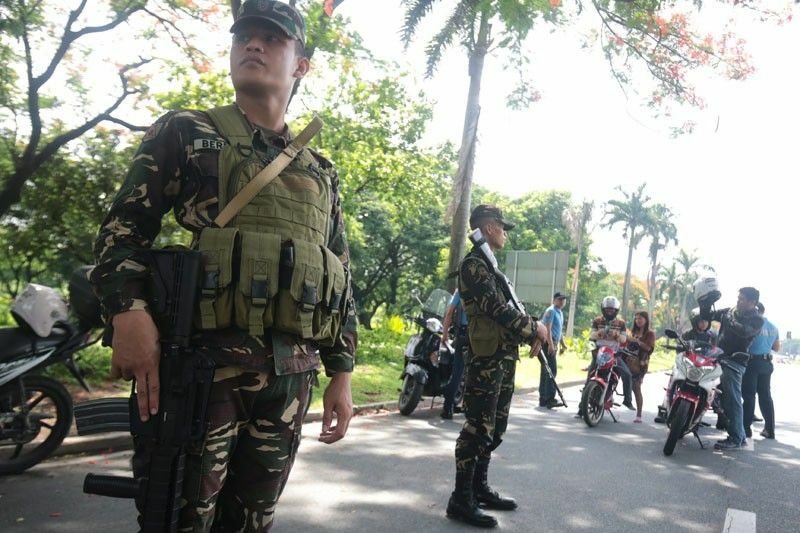 MANILA, Philippines — Threat groups still operate in Mindanao and martial law needs to remain in place there to keep them from recruiting and regaining strength, the Armed Forces of the Philippines said Monday. In an interview on Radyo5, Col. Noel Detoyato, AFP public affairs chief, said that these groups include those aligned with the Islamic State of Iraq and Syria like the Maute group and remnants of Ansar Al-Khilafah Philippines. He said the New People's Army also remains a threat, saying the communist rebels are being affected by increased military operations against the Maute group. "Rebellion in Mindanao is a continuing crime. They are in the process of recruiting, training, positioning," he said of the terror groups whose siege of Marawi in Lanao del Sur prompted the declaration of martial law in Mindanao in May 2017. He said that the military is concentrated in areas of Davao del Norte, the Surigao and Agusan provinces, and the outskirts of the cities of General Santos and Cagayan de Oro. Troops have also been deployed to Cotabato City as well as Isulan and Tacurong in Sultan Kudarat province. "These are growth areas that we are keeping secure so they will continue growing," he said. He added local governments and residents have "become obedient" because of martial law. Neither of those are included in the justifications for martial law listed in the 1987 Constitution. Rep. Edcel Lagman (Albay), in a separate Radyo5 interview, said he is hopeful that the Supreme Court will have a different appreciation of the factual basis for martial law in Mindanao—extended for a third time until the end of the year—since the situation on the ground has changed. "In the first place, this new extension of one year, it has been almost two years since the siege of Marawi, which the president said is over," he said in Filipino. "Marawi has been liberated and the supposed principal leaders of the terrorist groups are dead." Lagman and six other lawmakers filed a petition before the Supreme Court on Friday, saying the extension of martial law is unconstiutional. He had earlier pointed out that, according to a military intelligence report, nobody was arrested for or charged with rebellion in 2017. That, he said, shows the rebellion in Mindanao is over. The Palace has countered this assertion, saying this means the rebellion persists since arresting most or all of the rebels would end the rebellion that the extension is premised on. Lagman stressed that the Armed Forces of the Philippines can address terrorism and lawless violence even without martial law. "Around 60 percent of the strength of the Armed Forces is already in Mindanao... they are deployed against 878 local terrorists," he said.